D.B. Weiss, Gwendoline Christie, Nikolaj Coster-Waldau, Natalie Dormer, Pedro Pascal, David Benioff. . Wallpaper and background images in the गेम ऑफ थ्रोन्स club tagged: photo game of thrones d.b. 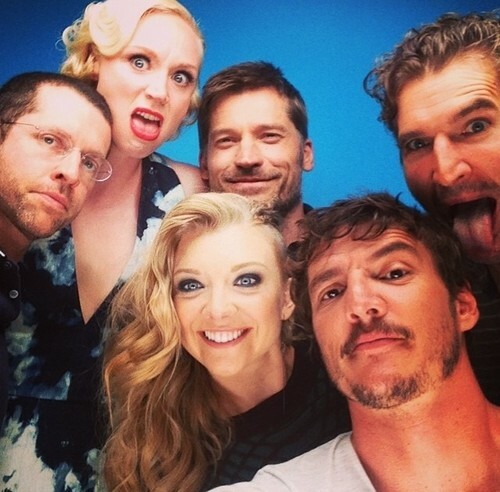 weiss gwendoline christie nikolaj coster-waldau natalie dormer pedro pascal david benioff. This गेम ऑफ थ्रोन्स photo contains चित्र, headshot, closeup, हेडशॉट, and क्लोज़अप.